As you may have noticed, I’ve been eating a lot of doughnuts lately. Why so doughnut-crazy you ask? Well, one reason is that all of a sudden, there are a lot of good doughnuts in New York. Case in point, around the corner of my apartment, early in the morning, The Brindle Room magically transforms into Wonder City Coffee & Doughnuts. 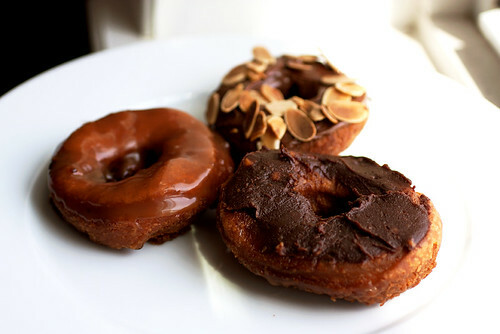 I like the chocolate-hazelnut doughnut, which is liberally covered with sliced almonds (pictured above, bottom left). The chocolate-hazelnut topping is creamy with just enough sweetness, and the toasted almonds are crunchy. Sometimes the chocolate-hazelnut is spread on thick so the doughnut hole gets filled up in the process. When this happens, it makes for a happier morning. The chocolate peanut butter (bottom right) is probably my least favorite of the bunch. It’s far from bad, but the thick chocolate peanut butter makes for a heavier tasting doughnut. Considering the doughnuts at Wonder City are of the denser variety, I feel lighter toppings work best. David and I weren’t crazy about the chocolate peanut butter the first time we got it, but on our next visit I noticed he ordered it again. Why? Because according to him, it’s still good. I couldn’t argue with that. Our favorite, by far, is the caramel (bottom left). The thin caramel envelopes the fried craggy surface of the doughnut and pools up underneath. After we finish a caramel apiece (two orders are a must, we refuse to share caramel doughnuts), all drippings are conscientiously wiped up. Forks work well, fingers work better. Doughnuts are available every morning (8am on the weekdays and 11am on the weekends) until they run out, but follow @WonderCityNYC on Twitter for updates and upcoming events. Two weeks ago, they had a Late Night Donut Happy Hour where you got a free doughnut after 11pm with a cocktail. Sounds like a good way to start off or end the night. Sounds like Doughnut Planet is better? @someguy – I don’t think I can say one is better than the other because they’re so different. I like both. I guess it would depend what kind of mood I was in. So excited you finally tried it! Now it’s my turn! @Lunch – I’ve been eating doughnuts like mad the past month! Yes, you must, at least once, if not more…. Get the caramel! Oh, I just had these yesterday! Agree that caramel is the best, and cpb is the ‘worst’. I thought the topping tasted slightly burnt actually. 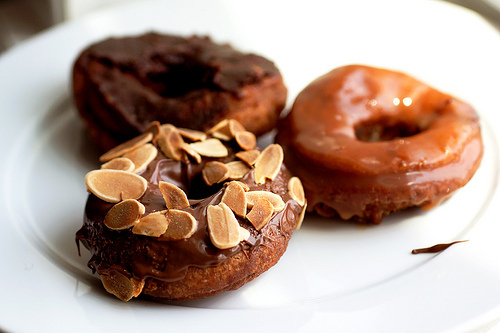 But I loved the crunch of the almonds with the donut.